The Spirit Engine 2 Game Review - Download and Play Free Version! Enter a fantasy world threatened by a cult of assassins. Only a feeble thread of peace keeps two opposing nations from waging a violent war, and that thread is stretched too thin as both sides blame each other for the assassins. Embark on an epic journey packed with ancient secrets, political intrigue and tons of exciting battles! Enjoy this game as a stand-alone adventure or as a continuation of The Spirit Engine featuring great graphics and a moving soundtrack. 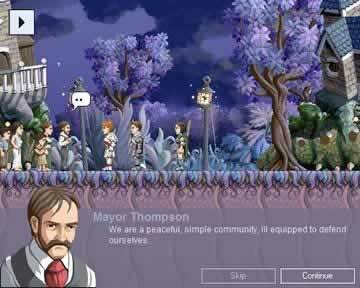 Before you start this side-scrolling adventure game, choose from nine different characters. The plot will vary depending on which three party members you select. Then choose your difficulty level and decide whether you want to leave it unlocked so you can switch in the middle of the game. Battle a variety of unique monsters and level up each character's skills, such as hack skills, passive skills, healing and more. Create chains of skills for each character to use during battle and even choose when to let them pause to build up larger attacks. The deep story and interesting characters will keep you coming back to continue this game, and once you're finished, you can play again using different sets of characters to enjoy plot changes. 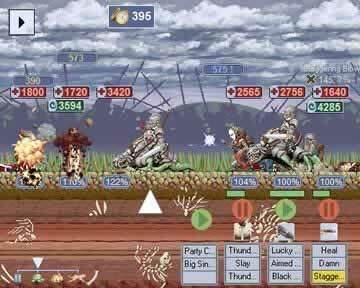 Devise unique skill chains for your characters and wage intense battles for long hours of exciting, addicting fun! Without your help, the world will fall into war and chaos! Battle to save civilization now with The Spirit Engine 2! The Spirit Engine 2 is a challenging side-scrolling role-playing game (RPG) that you won't want to put down. A mysterious and evil group known as the Keepers have recently appeared and their work brings two nations to the brink of war. You'll need to explore the world and engage in fierce battles as you seek to uncover their plot and avoid war. You'll form a party of three heroes that travel together throughout the game and aid each other in battle. There's a lot of strategy that comes into play in battles, especially with the ability to chain and time skills. As you defeat enemies, your party will become more powerful and improve their skills. This is a worthy game for any RPG fan. You begin the game by choosing the members of your party. There are a total of nine characters to choose from, each with a class and personality type. You'll need to pick one of each personality type (and it is recommended to have one of each class too). Each character has their own background that will influence their dialogue throughout the story. You then choose the level on difficulty (there are four options ranging from easy to absurd). After that, you jump right into the action. You begin with a small chance encounter that has your characters working together to search a forest for missing children being pursued by a masked villain. As you search, you'll come across various monsters and eventually the masked attacker. From this point on, your party decides to stick together in their travels as they seek to unravel the mystery behind the group that the masked attacker belongs to. Combat in The Spirit Engine 2 is very involved and somewhat complex. You have three characters in your party that will take on anywhere from one to three enemies at a time. Characters in your party can be arranged to be at the front or back of the party, which will affect whether they can be attacked and how much damage they take. Characters have various skills that they can use to deal damage, heal, powerup teammates, or weaken opponents. These skills require energy that slowly restores throughout the fight, and often have secondary effects or deal specific types of damage. Skills can be setup in chains that have the character use several abilities a row, allowing you to put together chains for specific enemies or situations (attack, defend, etc). All of this means that you'll need to pay attention and be involved in combat to win battles. A lot of strategy can also come into play, meaning that being prepared and putting together good chains of skills is important. One possible issue is the level of difficulty in the game. 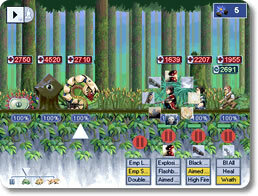 Even though you are given four options to pick from for the level of difficulty, you might find the game very challenging even on the easiest difficulty. The complexity of the combat system and the time it takes to get the hang of combat and chaining skills doesn't help, and can be a bit frustrating early on. The graphics in the game aren't that amazing, but don't really hurt the game either. Everything is simply 2D due to the side-scrolling nature of the gameplay, but still fairly detailed. The music and sound effects are done very well, and really draw you into the action. If you're a fan of RPG games, The Spirit Engine 2 could be the perfect game for you. There's an interesting story that changes slightly depending on the characters you pick. You'll form a party of three heroes that travel together throughout the game and aid each other in battle. There's a lot of strategy that comes into play in battles, especially with the ability to chain and time skills. As you defeat enemies, your party will become more powerful and improve their skills. This exciting and challenging game is one that you won't want to put down.